Zex blitzes though 10 songs in a half-hour on this record and prove that they’re contenders and not pretenders. Ottawa, Canada’s punk-rock group Zex is a band with some international reach. After releasing two singles (at least one came out on a Brooklyn-based label), the band toured the United States, Malaysia, Indonesia, Singapore, Australia and New Zealand. There’s even a cassette pressing of their new album Fight for Yourself that’s available in places such as Malaysia, Columbia and the Ukraine. Not bad for an outfit that’s a year old. Zex is female-fronted punk that is an exact replica of classic punk from ’77: they’re what you’d get if Blondie, pre-disco era, joined forces with the early Clash. In fact, the band’s sound is so carbon copy (which is not a bad thing as they completely capture the spirit and essence of the genre) that if they’d formed in London, England, my bet would be that music journalists would be creaming their jeans over these guys at the moment, calling them the Next Big Thing. Put another way, Zex so faithfully recall what makes early punk rock so great, music nerds (such as myself) can’t help but fall for these guys. Throughout the course of 10 songs blitzed through in a half-hour on this record, Zex prove that they’re contenders and not pretenders. Fight for Yourself is studded with songs that stick to your brain like glue. (Sniff it if you must.) That makes the group heads and shoulders above other punk rock bands who try to capture lightning in a bottle. Clearly, Zex is not interested in the Ottawa sound, whatever that may be, but in mining a vein that’s way more universal. Full of guitars that riff histrionically, pissed-off vocals from Gretchen Steel (who is said to perform live not always fully clothed), and great melodies, Zex are true rebels – which is apt as there’s a song here titled “We’re Rebels”. 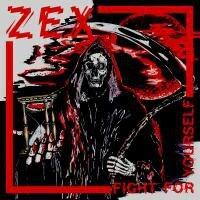 Let’s just say if you miss the classic punk rock sounds of the late ‘70s and possibly the early ‘80s (I hear hints of such groups as the Dead Kennedys in some of this material, along with a bit of Ramones influence), Zex more than aptly fit the bill. This is a band that struts, doesn’t devolve into cliché, and, basically, are the sort of snotty-nosed brats that you wouldn’t want to get into a fight with them in the street (notwithstanding the fact that you’d be fighting a couple of women in this quartet). Zex brings heft and muscle to their music, and, simply put, if you like awe-inspiring music regardless of genre, you need to get this band into your life right now. Like, right now. Go.